Drives like a car. That’s why this is Lexus’ best-selling vehicle. Well-appointed interior, perfect road manners, excellent crash-test results, optional four-wheel drive. Lexus was the first automaker to offer a true car-based luxury SUV, and consumers have rewarded the company by making the RX 300 the best-selling Lexus in the land. Touted upon introduction as a “new breed of SUV,” the RX 300 is supposed to offer the style, versatility and poor-weather traction of a four-wheel-drive sport-ute without negatively affecting ride, fuel economy or ease of entry/exit. We would deem the mission a success. Rather than employ a conventional body-on-frame design, Lexus built the RX 300 on a unibody platform that shares more than a passing resemblance with the Toyota Camry. With dimensions similar to those of the Jeep Grand Cherokee, the RX 300 can be classified a midsize SUV, thanks to a maximum cargo capacity measurement of 75 cubic feet. Powering the RX 300 is a smooth-revving 3.0-liter V6 producing 220 horsepower and 222 pound-feet of torque. Eighty percent of peak torque is available as low as 1,600 rpm, which translates into spirited acceleration around town. The all-wheel-drive version sprints from rest to 60 mph in 9.1 seconds, which is about average for a midsize SUV. Equipped with a silky four-speed automatic transmission and riding on a four-wheel independent suspension sprung with MacPherson struts at each corner, the RX 300 drives just like a lighter, marginally more nimble minivan. With a large, rakish windshield and goofy front quarter-windows, the view from the driver seat imparts the same feel as a Toyota Sienna. Unlike the Sienna, the RX 300 can be had with your choice of front-wheel drive or full-time four-wheel drive. Not only does the front-wheel-drive version perform better and get better fuel economy, but it benefits from standard electronic traction control to improve poor weather performance. Four-wheelers include a viscous center differential that directs torque to the wheels with the most traction whenever slippage occurs. The RX 300 tackles daily driver tasks quite well. The softly sprung suspension soaks up road irregularities, the steering is light and linear, and the brakes are quite strong. However, when it comes to serious work, whether on or off the road, the Lexus proves ill-equipped. It lacks a low-range transfer case for anything more than light off-roading, and maximum towing capacity is 3,500 pounds, which is 3,000 pounds less than a 4×4 Jeep Grand Cherokee V8. Don’t expect to canyon-carve, either, as the suspension lets the body roll excessively when the RX is pushed hard in turns. Inside, the RX 300 is spacious and comfortable up front; less so on the low-mounted rear bench. The optional leather package includes cowhide on the seating surfaces and headrests, and the stuff actually feels like leather instead of vinyl. 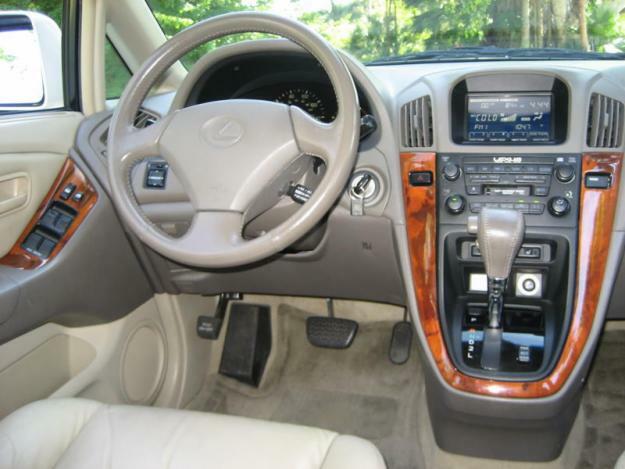 Dashboard materials and instruments feel substantial and are obviously shared with a number of other Toyota products. Safety highlights include standard side airbags and stability control (Toyota’s VSC), and the RX 300 scores highly in federal government crash tests. Audio and climate control functions partially rely on information displayed. The knobs and buttons for the stereo and climate control are small. Cargo capacity, all seats in place: 30.7 cu.ft. Maximum cargo capacity: 75 cu.ft. Fuel tank capacity: 19.8 gal. Range in miles (cty/hwy): 336.6/415.8 mi.